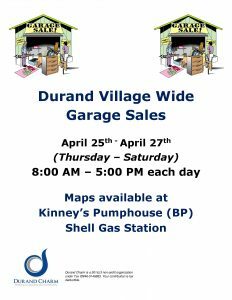 Durand Charm is a community-wide, volunteer-driven, non-profit organization that strives to restore beauty, economic prosperity, teamwork, and pride to the Village of Durand and its surrounding area. Durand Charm is a 501c3 organization. It is run by the Board of Directors, appointed from the goal group. Each committee can have two members that represent the group on the board. For questions or to become involved with a goal group, please click CONTACT US. Want to list your garage sale for FREE? Contact Chris DeSchepper at chrisdurandcharm@gmail.com. Please include the day(s), time, address and a few items to list on the map in your email. 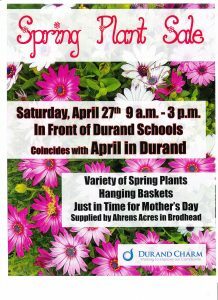 Durand Charm will be holding our annual Spring Plant Sale outside of Durand School on Saturday, April 27th from 9:00 AM – 3:00 PM as a part of April in Durand.